How do the most successful schools run their Created By Kids art fundraisers? Find out here! École Lac des Bois - Prince George. Involving Teachers = Massive Success! École Lac des Bois PAC is fundraising for a new playground (new playgrounds are not cheap). How could they divert as many funds as possible to the playground project, and still raise "discretionary funds"* for the teachers? The answer the previous year was no discretionary funds. The answer this year was found in the Created By Kids Art Fundraiser. Bonnie, the PAC Secretary, explains that "When I was contemplating ideas to raise (discretionary) funds, I thought that the teachers would have more commitment if the funds we raised went to their discretionary fund. Et voila...success!" She went looking for an "art card fundraiser" and found Created By Kids. It was a perfect fit because it was a "fun, straightforward, well organized fundraiser" that was sure to be a hit with students and parents alike. And by making the teachers' discretionary funds rely on it, she got immediate and deep buy-in from the teachers - brilliant! As it turns out, École Lac des Bois' Created By Kids Art Fundraiser was off the charts successful - one of the biggest we have seen! The teachers are happy because they got their discretionary funds reinstated. Students and parents are happy because they got beautiful, original works of art reproduced while raising funds for the school. And the PAC is happy because they now have that much more money for the playground project. Besides having the teachers take ownership of creating the artwork with the students (through their direct link to the profits), École Lac des Bois also enjoyed the fact that they paid no shipping charges or setup charges of any kind - not always the case for schools outside the Greater Vancouver Area of BC. To conclude, Bonnie would recommend to any school running a Created By Kids Art Fundraiser, link the success of the fundraiser directly to your teachers' funding, and watch the profits come rushing in! *Many schools provide discretionary funds to classroom teachers to buy extras for the students, help pay for field trips, etc. "The products you supply are fantastic and delivery was amazing. Your customer service is impeccable!" Michelle and the PAC at Topham Elementary in Langley, BC have run Created By Kids several times - all successfully, and all in the spring! Have the principal (or a PAC representative) present the program to the teachers at a staff meeting. They had tried a different "art card fundraiser" before, but had more success with Created By Kids, because the variety of items available made for more orders, the profits per item were higher, and the final products were of a high quality that made it easier to promote the fundraiser next time around! Once they had momentum from the first fundraiser, they were able to run it successfully several more times. Their favourite part of the Created By Kids Fundraiser? "Seeing how creative and proud the kids were of their work. Also, how easy you made it for us!" École Poirier Elementary - Sooke. Early construction on the now complete playground project. École Poirier on beautiful Vancouver Island has been "off the charts" with their Created By Kids success. We don't necessarily recommend running "CBK" fundraiser 3 times in 14 months (once per year is enough), but Poirier wanted to get a playground sooner than later, so they went Fall-Spring-Fall with Created By Kids fundraisers. The crazy thing is, their orders went up each time! "Our Vice Principal discussed with all teachers at one of their monthly meetings plus I wrote a short letter and handed out to all teachers, stating what our end goals were for the money raised. Some of the teachers used the current art curriculum – there was some amazing Native Art created by a number of classrooms!" Also, after running the program once, not only did parents and students have an idea of the awesome products available in this art fundraiser, but teachers knew what looked best and brainstormed together for ideas. The teachers also took advantage of the instructional videos on the Created By Kids website to get ideas for eye-popping artwork. By having a clear fundraising goal, showing their families how nice the finished products were, and communicating with teachers, École Poirier was able to increase their fundraising total each time! 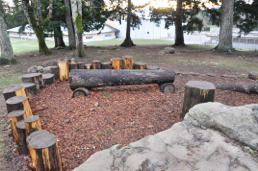 And by the way, Dec 7 was the grand opening of a new nature playground at École Poirier! Dorothea Walker Elementary - Kelowna. In the past, Dorothea Walker School had done art card fundraisers which only had cards. When they found about Created By Kids and the many available products, they jumped at the chance to participate. And then they set a record for the largest Created By Kids fundraiser to date! I asked Joanne how they did it. It starts with making the project count for teachers. "The funds we raise directly impacts teachers as we use them to purchase art related equipment for our school. The equipment is used by all grades and teachers." Also important was clear communication with parents. "Teachers send out news of the fundraiser through their weekly email to parents and then send the original art home with each child. I really think it is the kids that are our best advertisement to the parents. They are excited to see their artwork on mugs, puzzles, cards etc." By keeping things simple and communicating clearly with teachers, students and parents, Dorothea Walker was able to run an incredibly profitable fundraiser. Joanne's favourite part of the Created By Kids fundraiser? "The products you offer and the efficient communication. You are very clear about your timelines so that is easier to stay on track."